Wisdom is the ability to live in a chaotic world. It requires the "knowledge behind the knowledge," which means an understanding of the hardware of the mind, its structure, as opposed to the software - the particular languages, sciences, and religions which the mind creates. This is knowledge of Chaos, of the real world in which we all live, and how to find the hidden universal order, the fractal pattterns, which lie behind it. The order follows and can be found by many methods that take you beyond yourself, including. By understanding the knowledge behind the knowledge you can make sense beyond meaning. Making sense of everything for yourself allows you to make the appropriate choices in the chaotic world of chances, to self-evolve towards the infinite. Although knowledge is without bound, Wisdom has a limited number of criteria. The criteria follow a basic mathematical structure, a core fractal upon which all of reality, and knowledge, are built. The criteria of Wisdom can be represented by a geometric image: the Wheel , as shown here. This symbol is found in all anthropological traditions of the world. It is the key, the Rosetta Stone, to understand these traditions, to comprehend how they all speak to the same human condition. The Wheel allows you to think universally and act globally, in tune with history and your own inner destiny. It is the basic teaching of any School of Wisdom. Today, for the first time, we have information about the Wheel from cultures throughout the world. Professor Arnold Keyserling has created a new holistic, global synthesis of The Wheel as his life's work. The modern Wheel is based on all cultures of the world, including the scientific and mathematic. The Wheel is the primal archetype which makes possible an understanding of the Wisdom of all cultures of the World. (Click on the Wheel to the left to see a bigger version of the Wheel). This basic symbol unites the differing traditions by their underlying mathematical criteria and conscious experience. All human Wisdom can be organized by and has a place in the Wheel. It represents the basic structure underlying all Wisdom. The Wheel is an open, holistic system with which a person can fashion their own philosophy and life meaning, and so reach a state of profound Awareness or Wisdom. From out of Awareness-Wisdom, you can know what chances to choose, and can live your life as a free, autonomous individual, yet integrated with the Cosmos and the infinite. This is the Path of Wisdom. When properly understood The Wheel can serve as a thinking tool to help you on this Path. It can help you to understand the connections between Science and Religion, the left and right brains. The dominant belief system of our time, the Myth of Science, can thenbe used in a practical and spiritually fulfilling way. The mathematical structure of the Wheel can be used to integrate Science into world culture, Religion and the great Wisdom Traditions of the past. The construction of the Wheel begins with a point in space. . The point is the Zero Dimension, the infinitely small place holder. It is described with the Natural Numbers. From out of the point two lines are drawn whereby the four chaos attractors form a cross with the 10 numbers. The line is in the First Dimension , made up of an infinite number of points next to each other in one direction. It is described with Whole Numbers. The Plane of the Second Dimension, made up of an infinite number of lines and described with Rational Numbers - multiplication and division inside of the radius 10 - generate the Pythagorean CHI, consisting of the fractions born out of division and the products of multiplication. The end of the 2 diagonal of the two dimensional CHI forms the center of two circles, one going up to 10, the other through the zero point. These circles spin along the center as a fixed axis to create a Sphere with Three Dimensions. The sphere and the Third Dimension is made up of an infinite number of planes connected to each other. This is described by the Real Numbers. In the third dimension the Wheel is divided into twelve equal sections as formed by the sound waves of the normal musical scale - the temperated cycle of fifths which make up the twelve tone scale. The twelvefold division inherent in tonal scaling corresponds with the twelve moon cycles or months of the solar year. The archetypal symbols of the zodiac shown below are used in many cultures of the world to represent the twelve sectors of the Universe surrounding the Earth and the basic components of time. 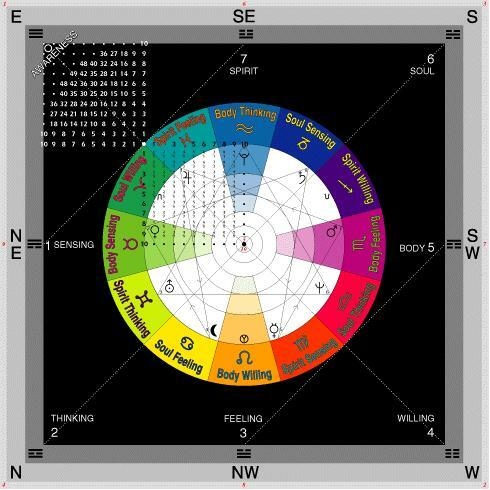 This is not astrology, although it does have some components in common with ancient astrology as developed in Babylonia in 2340 B.C. In the third dimension the twelve fields of the Wheel also constitute the light - pigments - color circle. The inside of the Wheel corresponds with the three dimensional structure of the inside of the atom which has up to seven layers of electron shells. The seven microcosmic shells of the periodic table of elements are pictured concentrically inside of the Wheel. The center of the Wheel corresponds to the nucleus of the atom. In the Fourth Dimension of Complex Numbers and Fractal Geometry, the real world of Man and Nature in which we live, the numerals organize the 9 criteria of Wisdom shown by the Enneagram inside the Wheel. Each of these nine represents a fractal - self similar, but not identical - repetition of the basic theme applied in a different field of knowledge. The basic theme is the underlying order behind all chaos and diversity - The Wheel - which makes possible a coherent philosophy of the World. This is a philosophy without walls, only foundations, underlying structures. The Wheel allows the "Myth of Science" to be used as a tool for self liberation, a function in the past filled only by religion. With the Wheel the meaning and significance of science, as well as the major religions and philosophies of the world, can be understood and applied for fulfillment. The philosophy of the Wheel is naturally one of tolerance because the Wheel allows you to see the common denominators underlying the different religions and spiritual traditions of the world. It is opposed only to dogma - where one person's dream and meaning of life is imposed on everyone else. You make sense of the Universe, you do not find sense that is already there, or sense made by someone else. You make it. Only then is true freedom possible, when you yourself make sense of your own life, when you explain life to yourself and do not take another's explanation of your life. To go further in Wheel research visit our Clickable Wheel and explore the 13 sectors (including the center) of the Wheel. Also you can order one of the School of Wisdom books for greater insights into the Wheel.